Heat the olive oil over medium high heat in a skillet or sauce pan. Add the onions and saute until translucent, about 5 minutes. Add the tomatoes, parsley, oregano, mint, sugar and salt and pepper. Lower the heat to medium low and simmer uncovered for about 20 minutes stirring occasionally. If the mixture appears too dry, add a little water to the pan. Peel and slice the eggplant into 1/2 inch rounds. Lightly coat both sides with flour and shake off the excess. In another large skillet, heat about a 1/4 inch of olive oil until shimmering but not smoking. Fry the eggplant slices on both sides until light golden brown (about 3 minutes a side depending on the heat of your oil). Remove the cooked slices and drain on paper towels or on a rack inserted over a half-sheet pan. Keep warm. 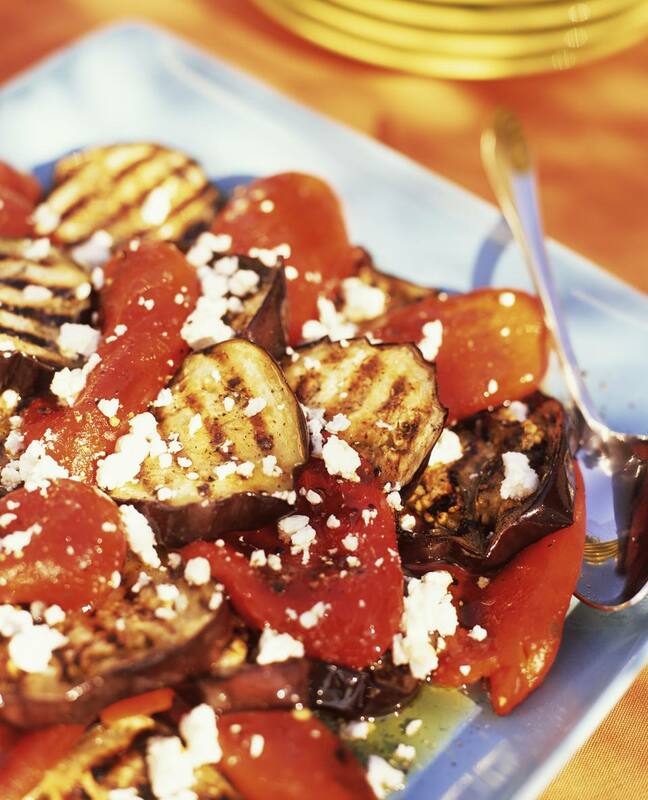 Place the eggplant slices on a baking sheet and top with the tomato mixture. Heat in a preheated oven for 10 minutes to melt the feta a bit and reheat any slices that may have cooled.